On March 29, United Nations Secretary General António Guterres stood in front of reporters at the UN headquarters in New York and delivered a grave message. Guterres – addressing the state of the world in 2018 and the greatest threat to humanity today – said the world’s “most systemic threat” was not one of bombs or bloodshed, but climate change. The year 2017 was one Guterres called “climate chaos.” Drought, floods, wildfires, and hurricanes displaced hundreds of thousands of people from their homes, causing over $320 billion in damages. Let’s rewind to November 2015. Canada is one of 196 countries that will eventually sign the Paris climate agreement, in which the signing countries announced national targets to reduce greenhouse gas emissions in hopes of preventing the planet from warming an average of two degrees Celsius. Justin Trudeau presented Canada’s goals at the summit – a 30 per cent reduction in emissions from 2005 levels by 2030. Interestingly, it’s the same goal Stephen Harper had set before him. Deftly ignoring Canada’s own sluggish-at-best response to global warming, Trudeau looked to grill India’s prime minister Narendra Modi during the Paris talks and encourage him to take greater action in the fight against climate change. Trudeau does a lot of encouraging, but provides no set deadlines on exactly when Canada will meet its own goals. Back to the present. On March 27, just two days before Guterres’ message to the world, federal Environment Commissioner Julie Gelfand released an audit of Canada’s climate change policies which painted a muddled picture of half-baked timelines, unkept promises, and inconsistent goals. It also confirmed what you may not be surprised to know – Canada is not only very behind on its 2030 goals, but there is no clear method for provinces to report on their progress towards these goals. Is this really a surprise? 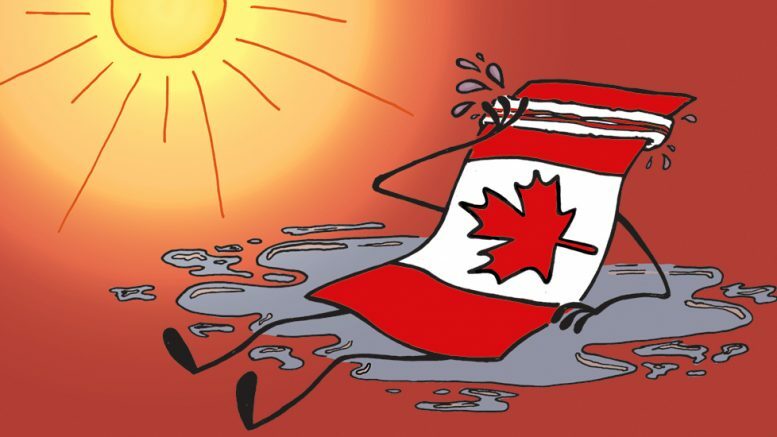 Canadian hypocrisy rears its ugly head often, and its approach to climate change – speeches and summits, with nothing set in place behind superfluous promises – is more of the same. Why do we react with disdain when watching U.S. president Donald Trump withdrawing from the same agreement that we can’t even maintain? Why do we feel superior when we have all but abandoned our own 2020 commitment to bring emissions 17 per cent below 2005 levels? This is not just a tragedy at the federal level. Canada’s provincial leaders have proven time and time again that climate change is not a concern on their radar, and in fact have used removing the sanctions suggested for climate change’s biggest offenders as an election point. Saskatchewan Premier Scott Moe has announced that the province will be taking the federal government to court over the carbon tax plan on the grounds of establishing whether the federal government has the right to impose such a tax. Considering it cost Manitoba $40,000 just to seek legal analysis on whether or not they themselves should consider taking the tax to court, the actual act of bringing the case to the Supreme Court will undoubtedly be expensive. And it is a case Saskatchewan, hopefully, will lose. Alberta’s United Conservative Party, that province’s official opposition, leader Jason Kenney found success in the Calgary-Lougheed byelection by focusing his campaign promises around scrapping the carbon tax. He continues to ride the wave of his promise to become Alberta’s next premier. Human airhorn Doug Ford has big dreams of repealing Ontario’s carbon tax, should he be elected premier. Then, of course, there is our own Brian Pallister, whose government introduced a “Made in Manitoba” carbon plan, which, rather than agreeing to meet the federal government’s goal of a $50 per tonne carbon tax in 2022, set a carbon price of $25 per tonne. It remains to be seen where those taxes will be directed within the province. Watching Pallister sing a jeremiad on the woes of cutting costs when doing so at the expense of healthcare, while simultaneously refusing to contribute in a progressive manner to the federal carbon tax plan is telling. What’s even more telling is watching the Progressive Conservatives kowtow to the whims of the province’s largest emitters of carbon, offering these corporations exemptions to the tax while Winnipeggers who ride public transit will be punished for making the environmentally-friendly choice due to a $1.2 million additional cost the carbon tax will add, due to fuel taxation, to the already-underfunded system. A plan “Made in Manitoba,” but for which Manitobans? The American billionaires behind Koch Fertilizer? While China and India have stepped up to become aggressive leaders in the fight against climate change, Canada continues to drag its feet. Rather than scolding international leaders, our federal government needs to turn its gaze inward. The fact that provincial leaders have been allowed to thumb their noses at the legislative framework that could hold the country’s biggest polluters accountable is shocking. The fact that multiple politicians have been able to base their campaigns on killing the federal carbon tax speaks to a national distrust in the federal approach to climate change. Judging by the unclear confusion brought to light by our climate change audit, that distrust is fair. Greater penalties should be imposed on provinces that refuse to do the work to combat climate change, and fast – before the taxation of the next generation becomes something much more dire. Would you kill your grandchildren for a boatload of oil?